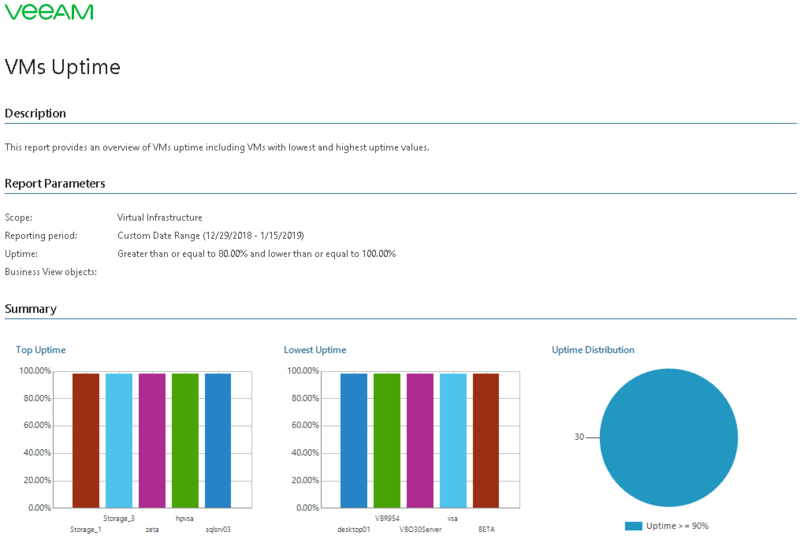 This report analyzes VM uptime statistics to track VM uptime. The Top Uptime and Lowest Uptime charts display top 5 VMs in terms of the highest and the lowest uptime values. The Uptime Distribution chart displays the number of VMs with different uptime values. The Virtual Machine Uptime table provides the full list of VMs whose uptime values are lower and greater than the specified thresholds. Uptime is a measure of time a VM has been up and actively running on a host. When a VM is not operating, storage space allocated to it is not being used productively. Use this report to track uptime of virtualized workloads. Scope: defines a virtual infrastructure level and its sub-components to analyze in the report. Business View objects: defines Veeam ONE Business View groups to analyze in the report. The parameter options are limited to objects of the Virtual Machine type. Interval/Start Date - End Date: defines the time period to analyze in the report. Note that the reporting period must include at least one data collection session for the selected scope. Otherwise, the report will contain no data. Uptime, greater than: defines the desired minimum uptime value. Uptime, lower than: defines the desired maximum uptime value.